Follow LoLa on Facebook for event news and sneak peeks at the work of the many talented artists. 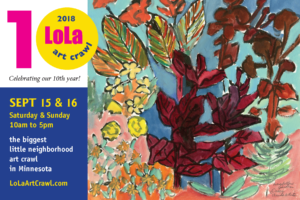 Follow League of Longfellow Artists (LoLa) on Facebook to sign up for the event for the latest news, and to see posts to get sneak peeks at the work of the many talented artists who will be exhibiting this year. Be sure to Like our posts and Comment about your favorite artists.